The 4400 are returning… again. 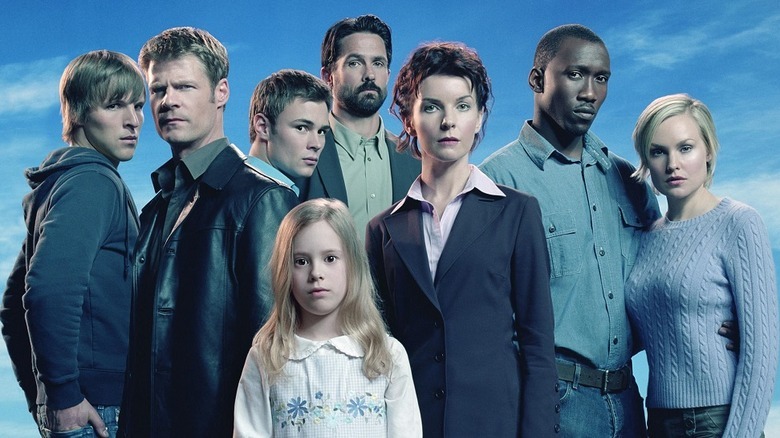 The sci-fi drama series The 4400, which originally aired on the USA Network, has a reboot currently in development at the CW, according to Variety. Writer-producers Taylor Elmore (Justified) and Craig Sweeny (who worked on the original series) are on board to co-write the pilot, with Elmore serving as showrunner, should the project be ordered to series. The original version of The 4400 boasted an interesting premise: 4,400 individuals with no apparent shared connection, all of whom disappeared without a trace from locations all around the world over the course of several decades, resurface all at once at the sites of their disappearances. None of them have any memory of where they've been or what happened to them, and none of them have aged a day — but some have undergone profound changes, manifesting paranormal abilities like telekinesis and precognition, and they face a government that views them with utmost suspicion. The well-received show ran for four seasons between 2004 and 2007 before USA unexpectedly pulled the plug, and is notable not only for being one of Oscar-winning actor Mahershala Ali's very first starring gigs, but also for its surprisingly dedicated fan base. Viewers have been lobbying for the show's return ever since its cancellation; as recently as 2015, fans were floating a petition imploring Netflix to revive the series. The reboot might not be exactly what they were hoping for — it's not at all clear if any of the original cast will be on board — but at the very least, Sweeny's involvement seems to promise a tone in line with that of USA's series. Elmore also makes for an interesting potential showrunner for the rebooted version. Aside from serving as an executive producer and writer on the critically acclaimed Justified, he served the same functions on CBS' Limitless, and is currently working on the intriguing Blood and Treasure for the network — another series with a novel premise (an antiques expert and an art thief team up to stop a terrorist who funds his activities with the sale of stolen art). It remains to be seen if the new series will follow the plot trajectory of the original, which slowly unraveled the mystery behind the disappearances and reappearances of the 4,400 individuals before ending its fourth and final season on a cliffhanger that was never resolved. A few tweaks to the formula are par for the course for reboots, and it would make sense to present a fresh take on the material rather than a rote retelling. CBS TV Studios, which co-produced the original, has been keen to take another look at the property due to its status as a cult hit — and with the recent emergence of similarly-themed projects such as A&E's The Returned and NBC's Manifest, the timing appears right to revisit a series which many fans feel wasn't given a chance to live up to its potential. The CW has enjoyed huge success with its live-action series based on DC Comics properties, including Arrow, The Flash, Supergirl, and Legends of Tomorrow. With a similar emphasis on superpowered individuals, The 4400 could continue its winning streak — assuming, of course, that Elmore and Sweeny's pilot script blows the doors off the network's brass. We'll have more details as they become available, but for now, here's hoping that The 4400 gets the triumphant comeback fans have been pining for — and that this time, it gets the chance to tell the entire story.